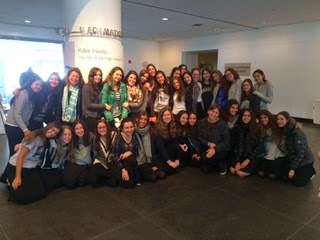 Yesterday, January 29th, a few students had the opportunity to visit the Brooklyn Museum to see the "Killer Heels" Exhibit. It was so much more than what I expected it to be. We witnessed and learned about all kinds of shoes from different time periods and cultures. These shoes weren't like your everyday regular pair of shoes. These were shoes with flamboyant colors and exotic structures. We saw all kinds of shoes. From heels to boots to sandals and even slippers! It was a fabulous experience and I can't wait to see what else the Pathfinder's Program has in store!